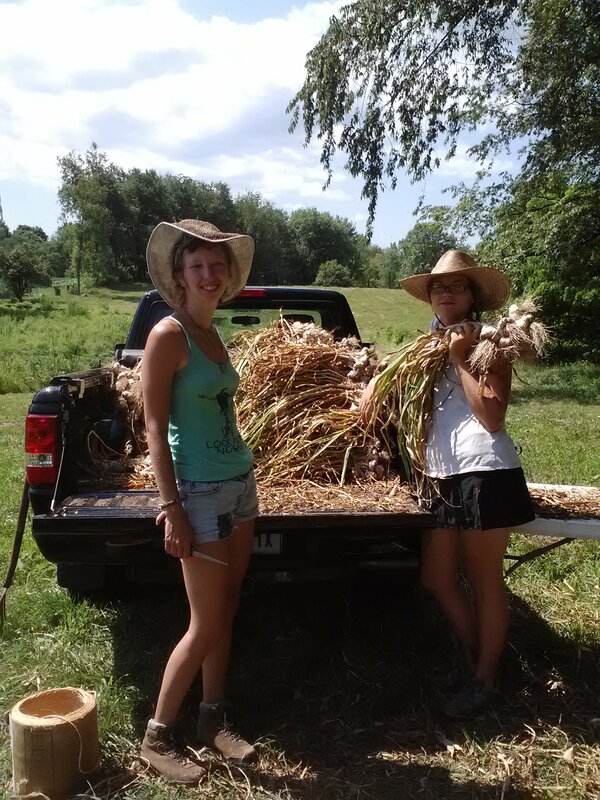 All the garlic pulled, ready to head to the barn for curing. Thanks to Dina and Wes’ parents for all their help! Our fields continue to provide quite a flush of produce, which is of course not the worst problem in the world, but we do end up having just too much. To that end, we are opening up the CSA to a few new members, so if you know anyone who is interested in joining, please let them know that we would love to talk to them. We would pro-rate the shares. On another note, this week we will start offering eggs for sale for $5/dozen. They are from fellow farmers at Old Ford Farm in New Paltz, where the chickens are free range and pastured. The eggs are delicious, the farmers are wonderful. 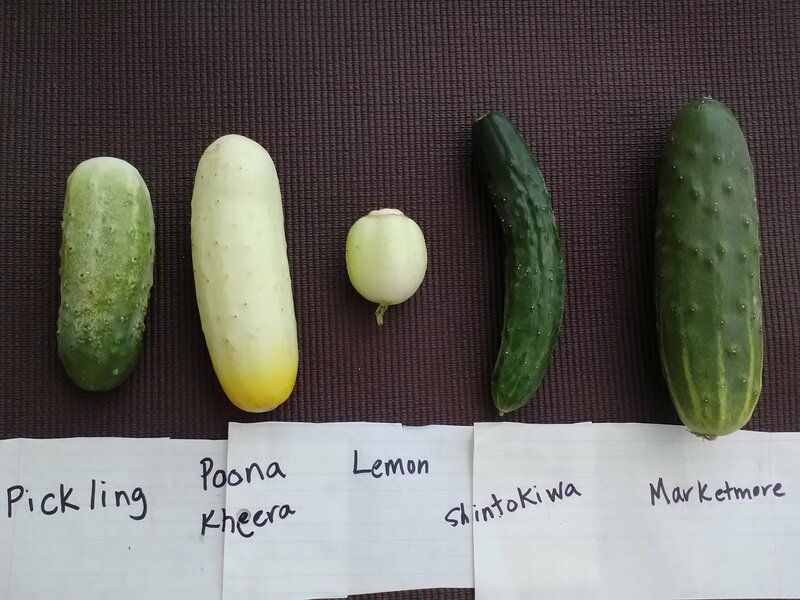 Meet the 5 cuke varieties we have this year. This is a good way to use those more giant-esque squash that we offer amongst the more reasonable ones. Note: for this recipe, the cooking instructions at the hollow circle bullet points refer to the chunk of ingredients above them. Split lengthwish, scoop out the seeds, and discard them. Carefully cut away (and reserve) flesh to form two shells, each 1/2-inch thick. Cook in frying pan until meat is browned. Drain off fat. Add, along with chopped zucchini flesh. Turn heat to high and boil, stirring often, until liquid evaporates, about 5 minutes. Add to filling and mix well. Place the zucchini shells in a baking dish and fill with the meat mixture. Bake in preheated oven at 350F for 30-35 minutes. Sprinkle on the filled zucchini halves. Return to the oven and bake until cheese begins to brown, 12-15 minutes. Remove from the oven and let stand 5 minutes. Garnish with 2 tablespoons chopped fresh cilantro and serve. While throwing one whole snap pea after another into your mouth in rapid succession is probably the quintessential way to consume these sweet delights, here’s a different, kind of fancy approach that might pique some of your interests. It’s a pureed pea soup. And, in case you were unsure, you can always shell your snap peas and use them like any other pea! 1. Bring 1 quart of water to a boil. As it’s heating, add the scallions, parsley and 1/2 teaspoon salt. Add about 3 cups of pea pods as you shell them. Once the water comes to a boil, lower the heat. Simmer for20 minutes, then strain. 2. Melt the butter in a soup pot and add the sliced onion. Cook over medium heat for about a minute, then add 1/2 cup of the stock so that the onion stews without browning. After 4 to 5 minutes, add the peas, 1/2 teaspoon salt and the sugar. Pour in 2 1/2 cups of the stock and simmer for 3 minutes. 3. Transfer the soup to a blender. Drape a towel over the lid and give a few short pulses to make sure it won’t splatter. Then puree at high speed for 1 minute. Pour into small soup bowls and serve immediately, adding a few drops of the truffle oil to each bowl.